2013 Viacom International Inc. All Rights Reserved; TEENAGE MUTANT NINJA TURTLES and all related titles, logos and characters are trademarks of Viacom International Inc.
Amphibious Assassin of Dimension X 2013 Viacom International Inc. All Rights Reserved; TEENAGE MUTANT NINJA TURTLES and all related titles, logos and characters are trademarks of Viacom International Inc.
Armed to the teeth with weapons, Newtralizer is one big bad mutant. 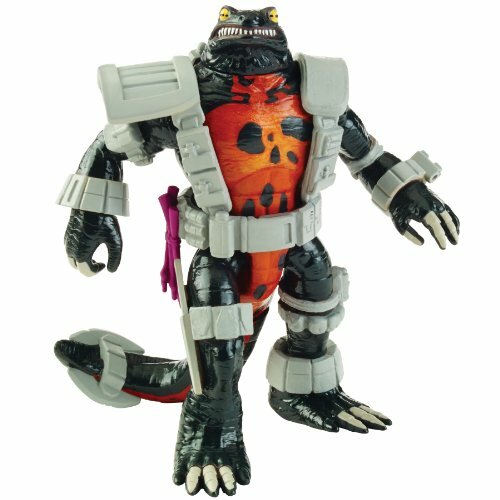 Being held in a detention center by the Kraang, this big mutant newt became the Kraang's number one enemy. As a bounty hunter, he tracks them down and takes them down, collecting their tentacles as he does. With unbelievable strength and a deep hatred for the Kraang, he proves to be more of an ally to the Turtles then a mutant to fear. WEAPONS: ???? TEAM: Ninja Turtles.